The most common species of azalea bonsai (rhododendron) is the satkuzi azalea. The satkuzi azalea originated in Japan. This plant produces different color flowers on the same plant. The colors include red, white and pink and grow in pairs, or singly. Satkuzi means, “fifth month” and is so named because the plants blooms in the fifth month of the year. Other types of azalea bonsais also produce bright flowers that are up to seven inches in diameter. Azaleas are technically shrubs, but you can prune and train them to grow into almost any bonsai style. Many Japanese bonsai enthusiasts grow only azalea bonsai plants. Select a location for the bonsai azalea plant. Avoid direct exposure to sunlight, particularly in the summer months. 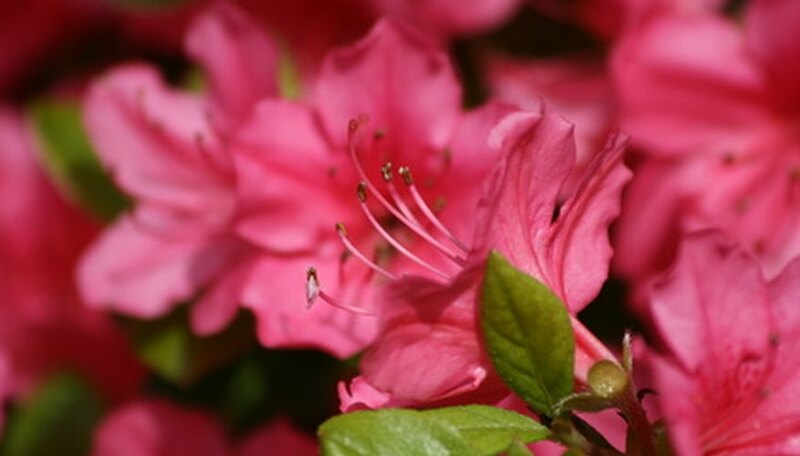 Direct sunlight strips the flowers of color and in some cases kills the flowers; therefore, it is best to provide filtered sunlight to the azalea bonsai plant. Water the plant with rainwater if possible. Rainwater provides optimal growth for bonsai azaleas. If rain water is not available, once a month water with a mixture comprised of 1 tbsp. of white vinegar with 1 gallon of water. Keep the soil moist. Dry roots are fatal to the tree. Feed the soil every two weeks in the spring until the plant blooms. Do not feed when the plant is in bloom. Once the plant no longer flowers, feed it monthly. Feed the bonsai azalea plant with slow-acting fertilizer. Dilute chemical fertilizers to half strength. Prune the bonsai azalea immediately after flowering, in the late summer. Remove any dead flowers, and reduce the number of new shoots growing out of the branches. Shoots grow in clumps of five; prune them down to two shoots with two sets of leaves each. Perform major pruning between early spring and early summer. Re-pot the azalea in late winter or early spring, when the leaves are first emerging. During the first few years, you may need to re-pot the plant every year, slowing to every two to four years for more mature plants. When re-potting, prune the roots, removing approximately one-third of the roots. Cut off any dead roots before re-potting. Protect the bonsai azalea plant from frost and heavy rain when the plant is in bloom.